Noticed I haven’t been cooking much? Well if you have its not because of a shortage of recipes, it’s just Summer. During this time of year I like to spend as much time outdoors as possible and if its hot out I definitely don’t want to be in the kitchen. If you’ve been reading my last few posts you’ll know how much I’ve complained about all the heat and humidity in the past month or so and haven’t wanted to turn on stove or oven! Well this past week has actually been very nice around here. Temps have been in the 80s with low humidity and well it’s just perfect for cooking so you may start seeing some solid foods on here soon! 🙂 Until then here’s a cool, creamy, spicy chocolate ice cream treat to hold you over. 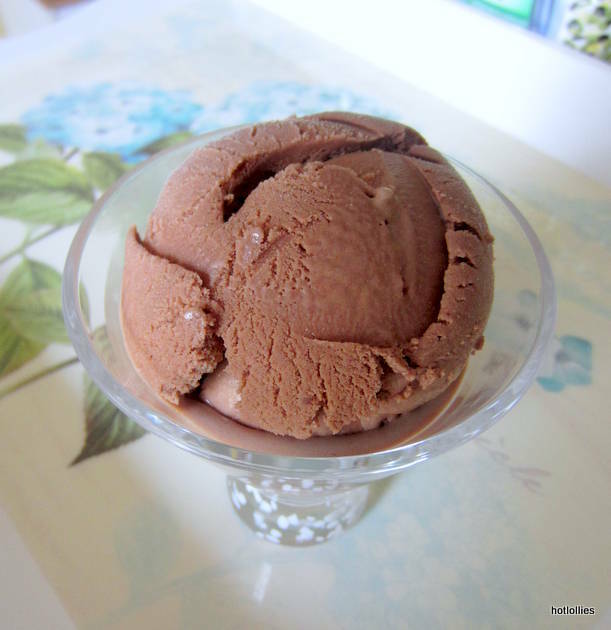 When you’re making chocolate ice cream, the most important thing is to use a good quality chocolate. 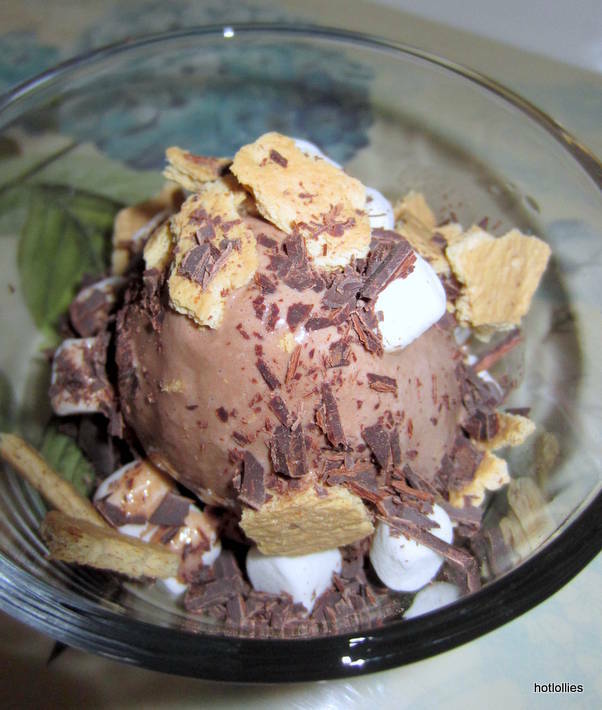 The smoother and creamier your chocolate, the smoother your ice cream. I used a wonderful handcrafted chocolate bar that a friend picked up for me while traveling to North Carolina. Escazu Artisan Chocolates makes small batch chocolates from the actual cocoa beans which they get from various countries. Knowing this just makes you appreciate the chocolate more since you know someone took special care in making it. 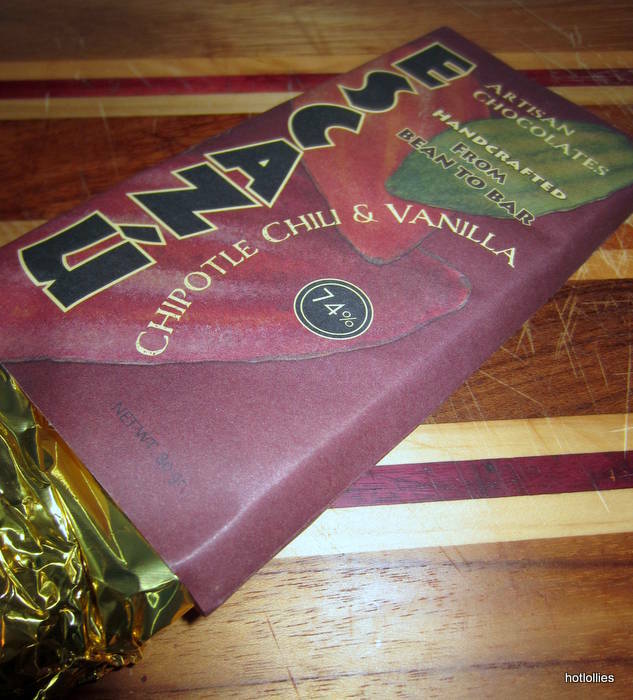 I had the chipotle chili and vanilla chocolate bar and used about half to make the ice cream. The recipe also called for cocoa powder so I used a good quality cocoa powder and spiked that one up with a little cayenne pepper as well. 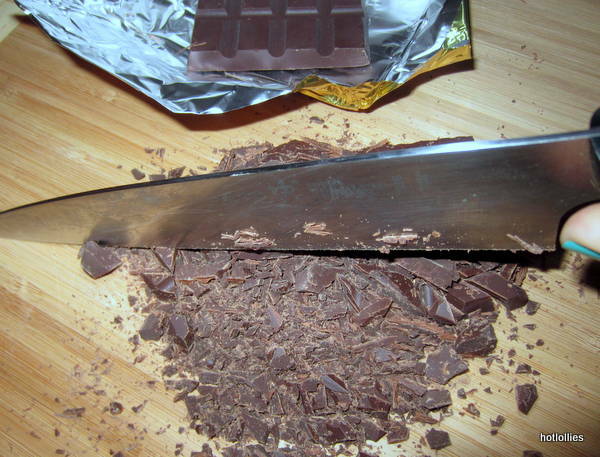 Chop the chocolate into fine pieces so it’ll dissolve easier when you’re melting it down. Once your ice cream is made you can enjoy it however you like but I chose to make things a bit more interesting. 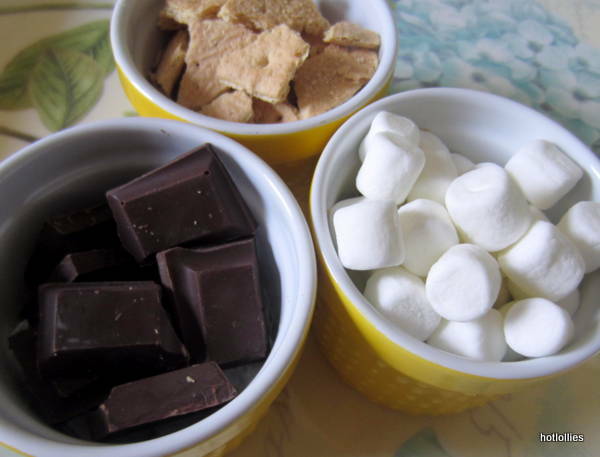 I crumbled graham crackers, chopped up chocolate and added mini marshmallows to mine for a crunchy, chewy and spicy chocolatey treat. S’mores are usually messy and the crackers always break when you bite down into it so you’re left with melted chocolate all over the place and bits of crackers everywhere. Well, I wanted the flavors but without the mess and all without a campfire…or stove top which is what I did sometimes! A fun idea for events or parties is to set up an ice cream bar and let everyone get creative with toppings. The ice cream came out silky smooth and the spice built up nicely. This will definitely be a summer tradition going forward in my household! 1. Mix half the sugar, cocoa powder, chili, nutmeg in a sauce pan. Over medium heat pour in the milk and stir well. When the milk mixture heats up add the chocolate, stirring constantly so it all melts. Let mixture come to boil and remove from heat. Do not let it boil over. 2. In a bowl beat the remaining sugar with the eggs until its light. Stir in the hot mixture very slowly and continue stirring while you’re doing this until all is well combined. 3. Stir in heavy cream slowly and add the vanilla. Refrigerate the chocolate mixture for at least 4 hours or overnight. 4. Make the ice cream per your ice cream maker’s instructions. 5. 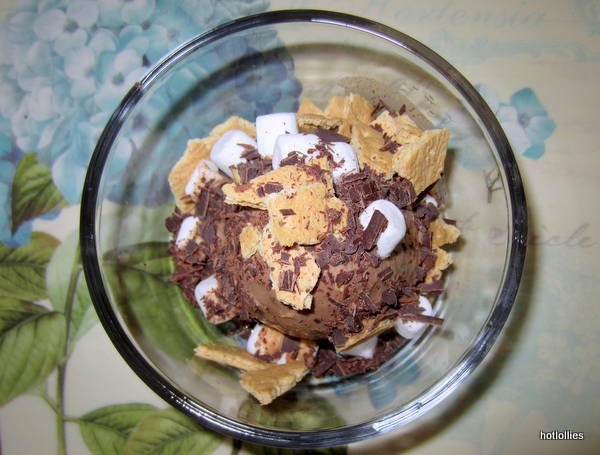 Once you have your ice cream, mix in the marshmallows, crackers and chopped chocolate. 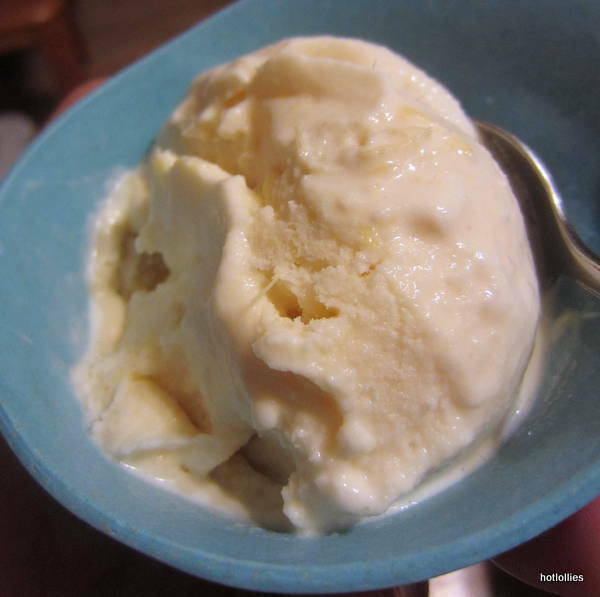 July is National Ice Cream month and to celebrate I made a spicy coconut ginger ice cream. Actually, I’ve been celebrating national ice cream month since May when the temperatures started to rise here in the Northeast but who is counting? This ice cream has fresh pieces of ginger to give it a nice bite and creamy coconut milk to make it all go down smoothly! Ginger has many benefits, from treating inflammation to helping tame nausea. I always recommend fresh ginger to expecting moms because it’s a natural way to ease morning sickness and has worked wonders for me when I’ve had an upset stomach. Coconut is also great if you’re looking for an ice cream with less dairy, it does not have any contrary to what some think…I think its the “milk” that throws some off. I used light whipping cream in this recipe instead of heavy cream and substituted the regular whole milk with the coconut milk. Coconut also has the good saturated fat and has been known to aid in weight loss, especially when consuming coconut oil as part of your diet. It’s gluten free as well for those watching their gluten intake. I’ve been reading about its benefit for years but as always, do your own research, I’m no expert here but do know what works for me. So get out that dusty ice cream maker and surprise your friends and family with a sweet and spicy treat! It’s pure and natural and perfect summer dessert for these hot, humid days!! Get creative if you like, add shredded coconut or some crushed nuts or fresh fruits…you could always blend them in after you make the ice cream. This recipe will yield a pint, if you want to make a quart, just double up the recipe. In a bowl, whisk together the egg and sugar until light then add the coconut milk, cream, ginger and vanilla. Continue whisking until well blended. Pour mixture into your ice cream maker and follow the directions according to your manufacterers instructions. 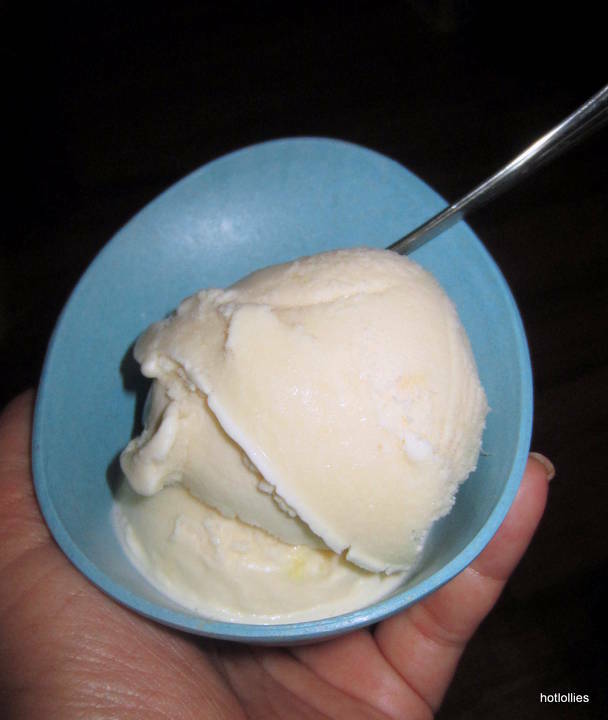 Once ice cream is made, add the ice cream to a container and freeze. Scoop into a bowl and enjoy on its own or mix in shredded coconut or chopped raw almonds for a nice crunch.